With the writing of this post after (ahem) a rather lengthy summer absence, I begin a series of posts on Viking time travel. Why Vikings? Three reasons: 1. I am mostly of Scandinavian descent so these are my peeps, 2. I am curious to learn more about them, and 3. While as a rule I don’t believe in signs, when I opened one of those Ed Hirsch Your Child Needs To Know This Stuff books last week, what did the book open to? Viking history. So there’s that. It would have been helpful to have read the Ed Hirsch book, or any other book about Viking history before I read Infinity Ring: Divide and Conquer, Carrie Ryan, (2012, 188 pages). Having only read, How W0uld You Survive as a Viking (my answer: not well), I know but little. The whole point of the time travel in the Infinity Ring series is to enable Dak, Sera, and Riq to fix mistakes in the past. Dak, Sera, and Riq might be in over their heads when they attempt to stop a Viking invasion! Hundreds of ships carrying thousands of warriors are laying siege to medieval Paris. The Parisians are holding their own, but the stalemate can only last so long. And that’s bad news — especially since Dak has been captured, forced to work alongside the Vikings while Sera and Riq defend Paris from within. No matter which side wins, the kids lose! Since I don’t know my Viking history, I didn’t know what was fact and what was fiction. So I couldn’t tell if the trio were changing history or not. Happily, I was able to put those concerns mostly aside and just enjoy the story. The story starts with a bang when after traveling through time, the three kids find themselves by an old stone wall. They peer over the wall and see thousands of angry Vikings advancing toward them! What follows is an imaginative account of what it might have been like to be in a city under siege in 885. Of course, what readers really want is to get up close and personal with the Vikings, so the author manages to get Dak drafted into the Viking army. There is plenty of action, with enough character development to hold my interest. The characters don’t seem 100% believable, but the snappy sarcastic dialogue between Riq and Dak makes up for this shortcoming. I’m always interested in the authors behind the stories. The author of this book, like me, is a resident of North Carolina. 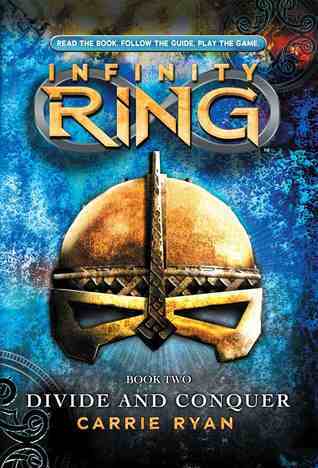 I think it’s interesting when a series, like Infinity Ring, is composed of books written by different authors. Unfortunately, I read the first one too long ago to long ago to be able to compare it to this one, but I wonder if anything would give away that they were written by different people. Is it hard for an author to keep the characters completely consistent? I think I’d like to read another book in the series to compare. Infinity Ring: Divide and Conquer is the second in a series of eight Infinity Ring books. This entry was posted in Book reviews and tagged Carrie Ryan, Divide and Conquer, Infinity Ring, kids' time travel stories, middle grade fiction, time travel books for children. Bookmark the permalink.